Beyond being the base for tempting chocolate varieties across the world, Cocoa is the source of rich and nutrient vegetable fat known as Cocoa butter. Cocoa and its resultant chocolates are known for enhancing the positive neurotransmitters in the brain and can make one happy and ecstatic at any given moment. The presence of chemical constituents like Tyramine and Anandamide are responsible for its euphoric benefits, where the word ‘Anandamide’ is extracted from the Sanskrit word ‘Ananda’, meaning bliss. Frequently blended with Jojoba oil, Cocoa butter is used in Ayurvedic remedies for treating stretch marks, scars, sunburn, mature and dry skin conditions, and for discarding dead skin cells. Standing tall as one among the key agricultural export commodities on the earth, Cocoa is the moral fiber for many countries in Africa, including Ghana and Cote d’Ivoire. With its direct meaning as ‘Food of the Gods, the seeds from the Theobroma cacao L. tree of the Sterculiaceae plant family are called Cocoa beans. Tagged as the ‘Golden Pod’ for its elemental part in the economy of the Nation, Cocoa is the pampered child of the province of Ghana. The Mesoamerica and Caribbean have been the prominent sources of Cocoa beans for centuries and are claimed to be indigenous to South and Central America. They have been harvested and put to use extremely for its moisturizing effect on the skin, accounted to its emollient properties, with a smooth texture and mild fragrance. Besides being used as food and medicine, the most interesting historical information about Cocoa beans is that it has been used as a form of currency since the primordial times. Even today, these brilliant cocoa beans are used as a currency type in certain parts of South America. Cocoa also has extremely high hydrating properties, making it a major constituent in bath and body-care products, soaps and beauty brands. Cocoa butter is often found as a chunk or bar just as chocolate which is extracted from the cocoa bean. The raw or organic form of cocoa butter is extracted from pure cacao oil, and its color varies from cream to pale white when it’s a chunk. Just as coconut oil, Cocoa butter is mostly a saturated fat. The concentration is seen in a quantity of 57% saturated to 64% unsaturated fat. This however may differ based on the kind of butter. There are different forms of cocoa butter, of which the raw or the unrefined Cocoa butter finds its place in the spot light. What makes it important? During the process of manufacturing, the raw form of Cocoa butter isn’t heated to high temperatures making it the purest form of Cocoa butter available. For this reason during sale, this form of butter is labeled as ‘pure cocoa butter’ or ‘Raw Cocoa Butter’ which retain the compounds that are found in the Cocoa beans. Cocoa butter is made by roasting fermented cocoa beans. Unlike other butters, cocoa butter is not separated from milk. After the butter is separated, the left over solids are used to make cocoa powder. The butter is then further squeezed to release ‘chocolate liquor’; it is from this that the well known chocolate taste and smell is given out. To remove the fragrance of chocolate from the cocoa butter, industries deodorize the butter to create a yellow-beige colored butter that smells natural. The cocoa butter produced is either consumed by the cosmetic industry, or the chocolate industry to make white and dark chocolates; the chocolate industry consumes the most cocoa butter in the world. The butter is known for being solid at room temperatures and melting at slightly higher temperatures (93–101 degrees F). For this reason, cocoa butter is put to use in pharmaceuticals as it becomes liquid when ingested or rubbed against the skin as a lotion. Cocoa contains theobromine, caffeine, anandamide, flavonoids, sulfur, proteins, magnesium, tryptophan and polyphenols including epicatechol. It also consists of numerous fatty acids like palmitic acid, myristic acid, oleic acid, stearic acid, arachidic acid, lauric acid, linoleic acid, glycerides and stigmasterol. Cocoa contains high levels of anti-oxidants, as they contain polyphenol and flavonoids. Cocoa beans are said to contain polyphenols. The butter extracted from these beans retains a limited amount of polyphenols which help lower inflammation, improve immunity, and perk up heart health. Cocoa butter exhibits anti-inflammatory, anti-aging, cytotoxic, nutritive, antiseptic, bactericidal, antispasmodic, emmenagogue, diuretic, nervine, aphrodisiac, stimulant, nervine and anti-oxidant properties. 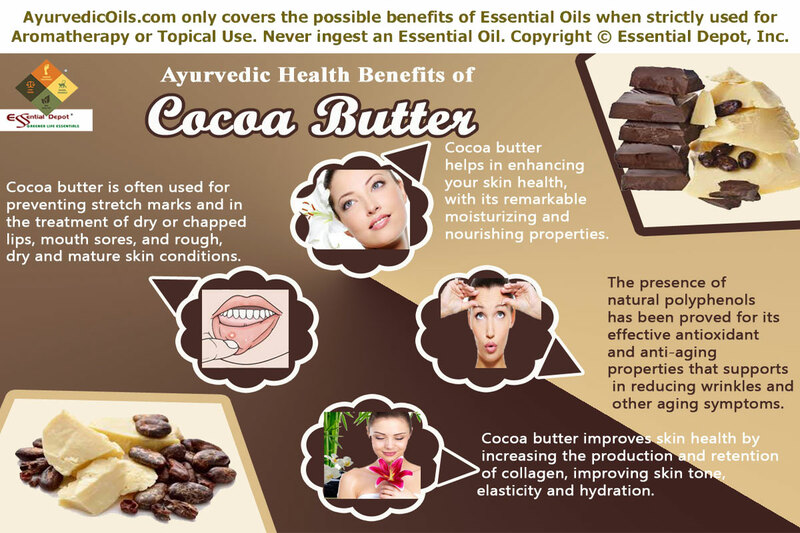 Cocoa butter is often said to pacify the kapha energy and aggravate pitta and vata doshas. Being an excellent relaxing agent for the muscles, Cocoa is a promising gift of nature for enhancing the natural energy quotient of the system. There are potent scientific proofs associated with the positive effects of Cocoa butter in treating mood fluctuations, regulating one’s appetite and in granting the ultimate elevated feeling of the mind and spirit. Ayurvedic texts state that the famous Asthma drug, Deriphyllin contains theophyline, which is an effective bronchodilator and is extracted from Theobroma cacao. Non-toxic, edible cocoa butter is said to have several uses to it. It finds most of its applications in terms of beauty and is constantly put to use for hair and skin. Regular use of cocoa butter on the skin can make it a lot softer and smoother. It can help reduce effects caused by eczema and dermatitis, treat chaffed lips, dry skin, and dry brittle hair, reduce stretch marks, and get rid of scars as well. They have extremely beneficial effects on the skin and improve skin health by increasing collagen retention and production, improve skin tone, skin elasticity and hydration. Cocoa butter has the tendency to penetrate epidermis (outer layer of the skin) and the dermis (inner layer of the skin) and starts restoring the repaired skin cells. The polyphenols are also said to resist cell mutation, skin sensitivities, and degeneration of skin and even prevent cancer. When compared with beauty products available in the industry, both showed positive results, but cocoa was able to achieve the same quality without the irritant chemical effects caused by other artificial products. A 2014 study was conducted on ‘Cocoa Bio-active Compounds: Significance and Potential for the Maintenance of Skin Health published in Nutrients and PubMed’ to understand the effect of polyphenol in cocoa butter in relation to the aging process. Signs of skin aging though related to internal biological causes, some are related to external effects, such as pollution and UV rays. During the process, the anti-photo carcinogenic effects of the polyphenols present in the plant were tested. The results suggested that polyphenols exhibited antioxidant properties, immunomodulatory, anti-inflammatory, and DNA repair properties. This study further adds that cocoa, which is rich in flavanol enhances the dermal blood flow, augments photo-protection and support healthy skin. The effects were positive and promising, suggesting that regular usage of naturally occurring polyphenols, can serve as protection towards the skin in relation to UV rays and photo aging. Cocoa butter can be used to treat eczema, dermatitis, rashes and even on burnt skin. Rubbing a small portion of the butter on the burnt area can minimize the burnt effect on the skin, but caution should be taken to check the purity of the butter making sure it doesn’t contain alcohol, or perfumes or any other additives that might worsen the existing skin condition. The butter can also be mixed with 2 Tea tree oil or Lavender oil can help in promoting the soothing effecting on burnt and sensitive skin. Cocoa butter has been commonly used on the lips as lip balms. It is mixed with orange, vanilla, grapefruit, and peppermint oil to make favored balms for lips and to treat delicate skin. It is a natural emollient and can be used as an extra layer to avoid sun damage, frost bite and even fight against indoor heat. 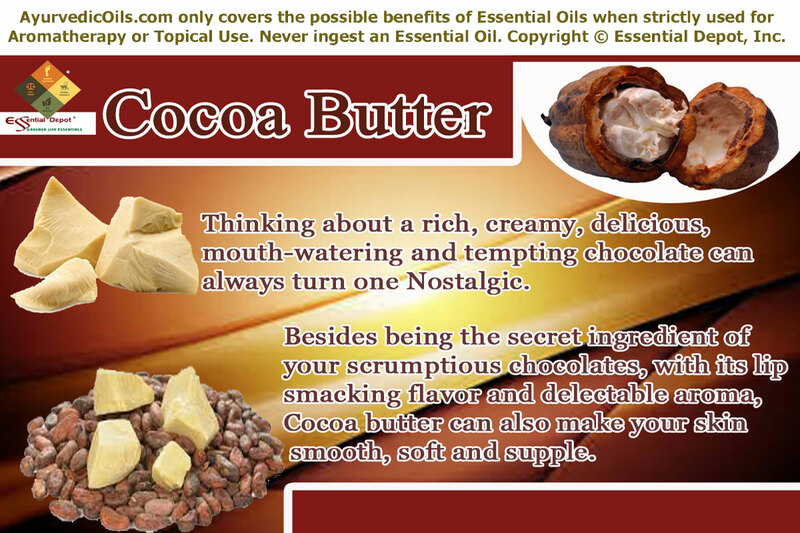 Cocoa butter can also be applied to mouth ulcers and sores on the lip to sooth them. It is also used as a shaving cream and as a relaxing after-shave cream. It can be applied to help prevent nicks while shaving and to moisturize the skin after. Applying a portion of cocoa butter after a warm shower can help in maintaining healthy skin. Since the hot water opens up the pores and make it easier to absorb the butter. Saturated fat once considered as the devil in disguise for heart related issues has now been considered with a smile when extracted from plants. Scientists have actually taken a detour on that theory, as it has been related to reducing the risk of cardiovascular issues. The polyphenolic components in the butter favor the reduction of inflammatory markers that lead to hardening of the arteries otherwise called as atherosclerosis; thereby attributing the butter as an anti-inflammatory agent. It is also associated with increased lipid metabolism, reducing the occurrences of heart attacks. According to a study published in the American Journal of Clinical Nutrition in November 2009, cocoa given to 47 patients with the risk of heart disease showed remarkable cardiovascular benefits. It evidenced improved signs such as reduction in cholesterol levels, blood pressure, improved blood clotting, insulin sensitivity, coronary artery function, and increased HDL cholesterol levels. Jillian Sarno Teta, a physician specialized in Neuro Cranial Restructuring along with Keoni Teta, a Naturopathic Physician and Acupuncturist talks about the work of Norman K. Hollenberg and his colleagues of Harvard Medical School on the Kuna tribe of San Blas, off the coast of Panama. Cocoa butter when replaced with vegetable oils help boost the system through their antioxidant properties. They help boost the immune system by eliminating DNA damage, inflammation, reduce risk of cancer, cardiovascular disease, fatigue and cellular mutations. Cocoa butter also helps boost the body and brain by creating a hormonal balance, thereby acting as a total immune system booster. These effects on the body help relieve stress as well. Greet and treat your body with the luxurious Cocoa butter retreat in the weekend, for enjoying the never before freshness, suppleness and enhanced wellness in the week ahead. Blend 5 drops of Geranium oil with 5 drops of Ylang Ylang oil, 5 drops of Lemon oil and 5 drops of Jojoba oil with 2 ounce of Cocoa butter and gently massage your system and leave it aside for an hour. The rejuvenating, revivifying, detoxifying, moisturizing, nourishing, uplifting and skin and hair-friendly properties of this blend is just more than enough for elevating and recharging your beauty, sensual and emotional quotient every week on and again. You are what you eat is a popular adage. Always ensure that you take up a healthy and nutritious diet with fresh fruits, green leafy vegetables, pulses and grains along with sufficient water for staying hydrated always. Soaps, lotions and other skin care products with natural ingredients like Cocoa butter and organic essential oils penetrate through the skin and back up your health and beauty regimen!!!! Kudos for your choice of pure, organic and natural products for your beloved family. Cocoa butter has the capability of remaining solid even at room temperatures. It also doesn’t get rancid as it contains anti-oxidants and hence can be stored for a period of 2-5 years. It is very simple and a lot similar to using other butters. Jut shave or cut a piece of butter from the cube, and gently massage it into the skin. The temperature from the body and the friction would melt the butter naturally. Another way to do it would be taking in the desired amount of butter and melting it in a hot tub of water and apply as you bathe. Some have faced issues related to melting the butter, and have found melting the same in a bowl dipped in hot water easier. Unlike other butters, cocoa butter is easily absorbed by the skin leaving the skin hydrated and less oily. This information is meant only for educational purposes. Please do not use it as a means for diagnosing or preventing any health condition. Never use it as a substitute for professional medical advice or prescription drugs. We are not healthcare practitioners and this information is shared only with the notion of bringing Ayurvedic healing wisdom under limelight. Organic butters and essential oils are meant only for topical application and not for ingestion. Consult your Ayurvedic professional/ healthcare expert ahead of picking the perfect essential oils or organic butters for your prakriti or unique individual constitution along with your state of health. This entry was posted in Essential Oils - Learn About and Purchase and tagged Ayurvedic health benefits of Cocoa butter, Chemical constituents of Cocoa butter, Cocoa butter for chapped lips, Cocoa butter for dry lips, Cocoa butter for mouth sores, Cocoa butter for sun damges, Cocoa butter for wrinkles, Cocoa butter in Ayurveda, Health benefits of Cocoa butter, Natural moisturizers for mature skin conditions, Natural remedies for stretch marks, Natural remedies for supple skin, Natural sun-screen protection with cocoa butter, Theobroma cacao, Therapeutic properties of Cocoa butter by AyurvedicOils. Bookmark the permalink.